Seamless integration with hundreds of applications including Salesforce, Google Calendar, Slack, Dropbox and JIRA helps teams easily meet and exceed goals. Redwood City, CA, April 30, 2015 — Today Workboard unveiled a significant update to its popular goal achievement and managers’ family of apps. 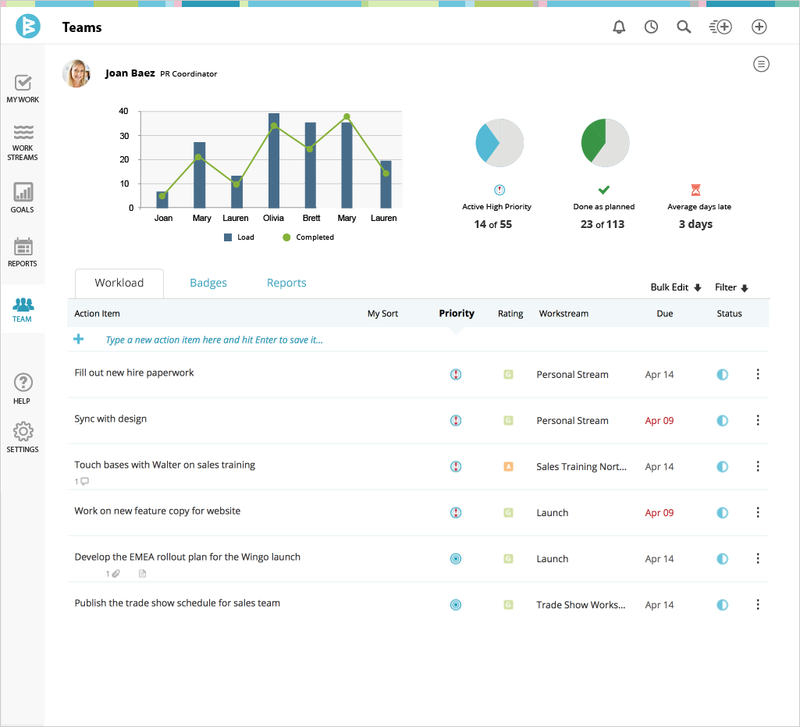 The update includes goal achievement ratings and dashboards, performance analytics for managers, support for 1on1 meetings and easy plug-n-play integration with Salesforce, Google Calendar, Slack, Dropbox, Evernote, JIRA, and many other applications. “Managers are choosing their own tools to bring goals to life for their teams and connect them to day to day work to improve team performance," said Deidre Paknad, Workboard CEO and co-founder. "This release of Workboard gives managers more ways to make goals relevant to people’s work and improve their team’s outcomes and results." When a new sales opportunity is created in Salesforce, a Workboard workstream is automatically created to coordinate deal team efforts in demos, presentations and proposals to win the sales cycle. When meetings with senior executives or clients are added to a calendar, an action item is created in Workboard to make sure preparation work is well done. When someone starts or adds to a conversation on goals or metrics in Workboard, it instantly posts to a Slack channel so the whole team enjoys the momentum. If tickets are managed in JIRA and the team and goal achievement are managed in Workboard, related action items and metrics are copied and synced between apps. A recent Gallup study highlighted how critical good managers are to company success – they account for at least 70% of the variance in employee engagement in the mission of the organization. From the report, “While great managers consistently engage their team to achieve outstanding performance, bad managers cost businesses billions of dollars each year, and having too many of them can bring down a company.” Workboard gives great managers the tools to be great leaders and helps new managers increase their competency, impact and effectiveness. The new integrations are free for Workboard customers. For more detail on Workboard's latest features, visit www.workboard.com. Workboard, Inc. is a fast-growing provider of real-time performance management solutions that high-achieving teams are choosing for themselves. Teams at more than 10,000 organizations rely on Workboard including large pharmaceutical, financial, technology, oil and manufacturing companies. The free Workboard Basic app helps managers and their teams coordinate priorities in real time, do and share work, automate status reports and improve feedback loops. The premium Workboard Elite app helps managers set and achieve team goals by making it simple to share goals, set clear success metrics, engage teams on priority work, automate status reports and provide better feedback. The company was co-founded in 2014 by CEO and serial entrepreneur Deidre Paknad and has enjoyed viral growth since its launch. For more information, visit www.workboard.com. Workboard offers performance analytics for managers.